By the late 1920’s the majority of bread had moved from being home baked to being factory made. The factory-made bread was incredibly soft and in turn, incredibly difficult to slice at home with a traditional bread knife, yet factory slicing would result in the bread being stale before it was even sold. In November 1928 Otto F. Rohwedder filed the first-ever patents on the mechanisms he created to slice and package bread. The jeweller from Missouri invented a machine with a conveyor belt and of a series of uniform cutting bands that would slice an entire loaf of bread in a single operation and then promptly and efficiently package the loaf. You can read Otto Rohwedder’s patent disclosing the slicer here US1867377A, one of the sliced bread packaging patents can also be found here US1816399A. Sliced bread was not an instant hit. Bakeries were sceptical that people would forgo the longevity of their loaves just so they wouldn’t have to slice it themselves. It was Rohwedder’s friend Frank Bench, owner of the Chillicothe Baking Company, who took a chance on the invention. Bench’s gamble paid off and the bakeries sales boosted by 2000%. Pre-sliced bread then went national when the Continental Baking Company introduced Wonder Bread to the country in 1930. Page 2 of Otto Frederick Rohwedder’s patent “Machine for slicing an entire loaf of bread at a single operation” filed November 26, 1928. The convenience of slice bread resulted in people eating more bread than ever before. The increase in bread consumption consequently increased the sales of spreads such as jams and even automatic pop-up toasters. Sliced bread was briefly banned during WWII in an attempt to reduce the amount of wrapping used on a loaf of bread. There were numerous objections and even letters from distraught housewives complaining of tirelessly slicing bread, the ban was subsequently lifted after less than two months. There was no going back, sliced bread was here to stay. The idiom "the greatest thing since sliced bread" is commonly used to praise an invention or development. This phrase references sliced bread as the ultimate innovative achievement, and as such it, of course, has its associated patents. 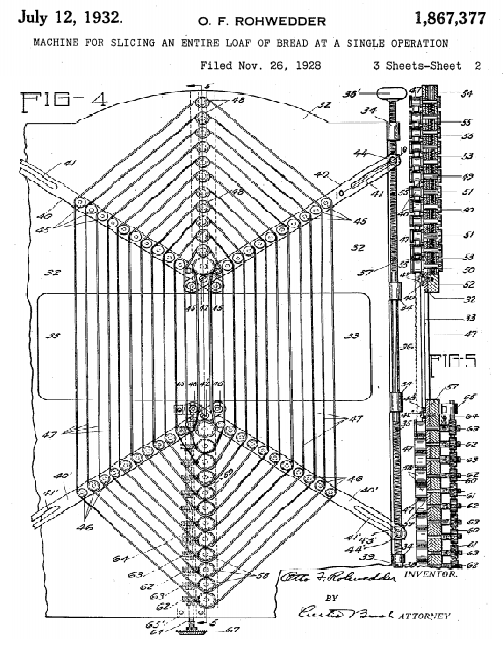 In 1933 Otto F. Rohwedder sold his patent rights to a larger company during the Great Depression. Patents do not just hold a legal role, but also a strategic one, good inventions that are protected by strong patents will be useful and therefore valuable. Rohwedder used his patents to survive the longest, deepest economic crisis in American history.